Jose Gonzalez: Unlikely Art Beneath the gentle exterior of Jose Gonzalez's soothing, lilting voice and trademark "chord-picking" guitar lies a deeper and sometimes darker driving force. For KUT's Retread Sessions, Gonzalez performed two songs at the Blanton Museum to pleasantly surprised visitors. 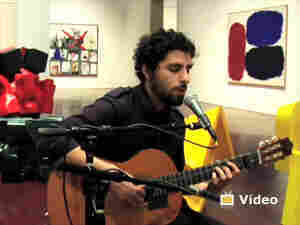 Jose Gonzalez performs in the Blanton Museum. Though Swedish folksinger and classical guitarist Jose Gonzalez has become a household name in the U.S. thanks to his music's inclusion on nationally syndicated shows like Late Night With Conan O'Brien and The O.C., the singer himself remains a bit of a mystery. Just how did a soft-spoken artist hailing from Argentina but raised in Sweden end up writing a collection of songs inspired by evolutionary biologist Richard Dawkins? Why is he drawn to songs like "Teardrop" by Massive Attack? Is this the same guy who started his music career in a band that owed its sound to Black Flag and the Misfits? The easiest way to understand an artist like Jose Gonzalez is to start at the beginning, but pay attention to the small details. As a child in Sweden, Gonzalez heard a lot of Cuban songwriter Sylvio Rodriguez, and to this day Gonzalez references him as an influence. A cursory listen to Rodriguez's works immediately sheds light on Gonzalez's affections, as his soft acoustic guitar and sophisticated voice are immediately comparable. Don't forget the small details, though: Rodriquez is revered around the world for his revolutionary ideals and political themes during Fidel Castro's rise to power in the '60s. Beneath the gentle exterior of a soothing, lilting voice and trademark "chord picking" guitar lies a deeper and sometimes darker driving force. The same is apparent with Gonzalez, who has cited both Dawkins and ethicist Peter Singer as influences on the lyrics in his latest album, In Our Nature. When we asked him to perform for KUT's Retread Sessions, he agreed, despite being on a very tight schedule. We hurried to find a place nearby for him to perform, hoping to find a space that would accommodate his soft voice and intricate guitar work. Our friends at the Blanton Museum offered us a space in their Americas room, a gallery that just so happens to contain large, brightly colored paintings and installations from Brazil, Cuba, and Argentina. Gonzalez performed two songs, "Abram" and "Time to Send Someone Away," amidst a hushed group of pleasantly surprised visitors and our crew, surrounded by the bright reds, yellows, and greens of his homeland's most visually stimulating artists. It was truly a wonderful moment, as artist became installation, one with his surroundings, in the middle of songs about the artist's need to escape those comforts and address the real, sometimes cruel and terrifying world.